The monday evening knitting class started with great enthusiasm and Amanda was so impressed with Jane, Helene and Sheri that rather than simply work on sample pieces, they are going to work on a pattern and learn as they go along! Pitch and Stitch was quieter than usual because Sandra is away in her camper! Love the pink pjs!!! 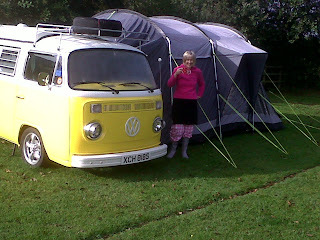 When I spoke to her this morning she was busy making campervan porridge! I am working on making a quilt of a picture Victoria drew when she was eight - it's for the children's drawings workshop we are doing later this term. Both children are away at college now - but back this weekend for the Agricultural Show which is one of the highlights of the year for us. I am STILL a harvest widow and am chained to the house awaiting delivery of a new dishwasher..... better do some housework!